The Floyd Bennett Memorial Bandstand was designed by a native of Warrensburg, architect Paul B. Gurney. 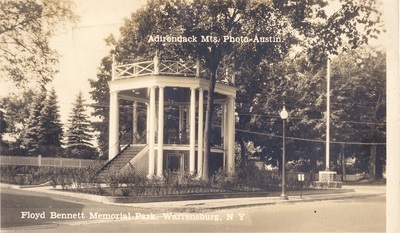 Erected in 1929, it was built in the Colonial style to compliment the Merrill home (formerly the Griffin home) and the Adirondack Hotel, both of which faced the park. 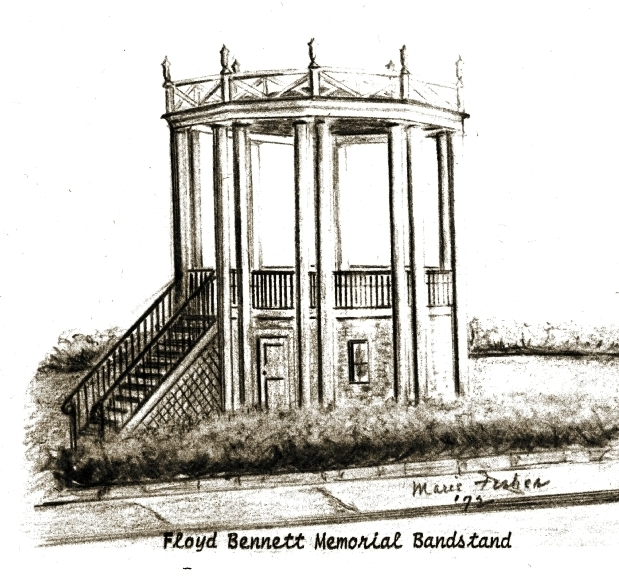 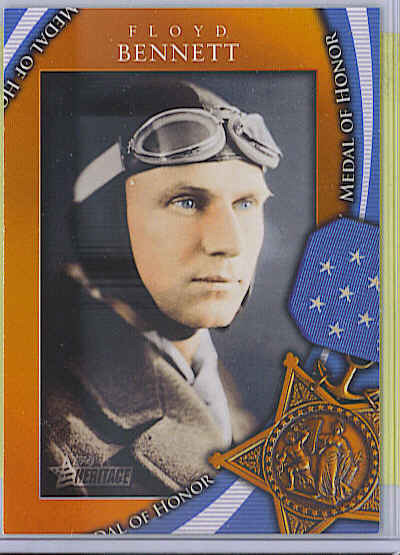 On May 31, 1931 a monument, including a flagpole, brick base and bronze plaque, were dedicated to the memory of aviator Floyd Bennett. 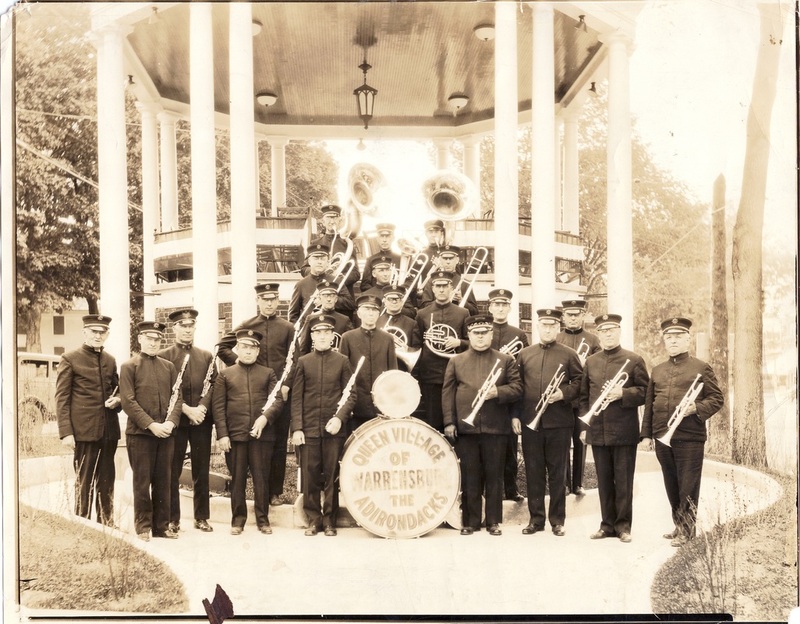 Concerts have been held there ever since, ranging from high school bands to country and western. 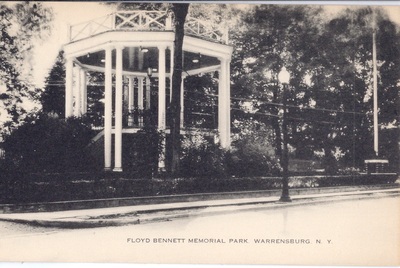 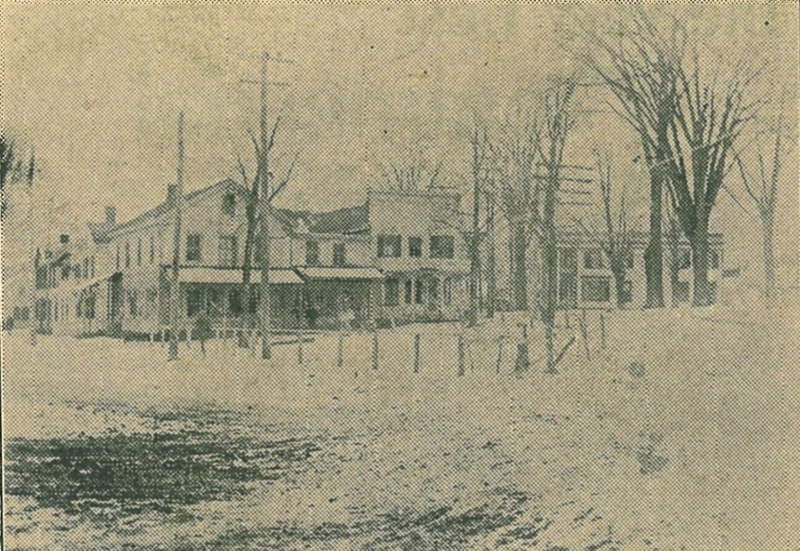 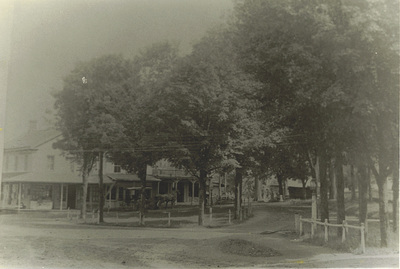 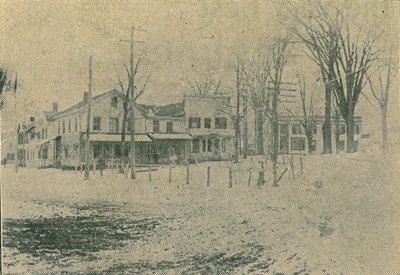 The property, owned by Alexander T. Pasko and later his son Emerald D., had been appropriated by the public as an informal park, with Mr. Pasko’s permission. 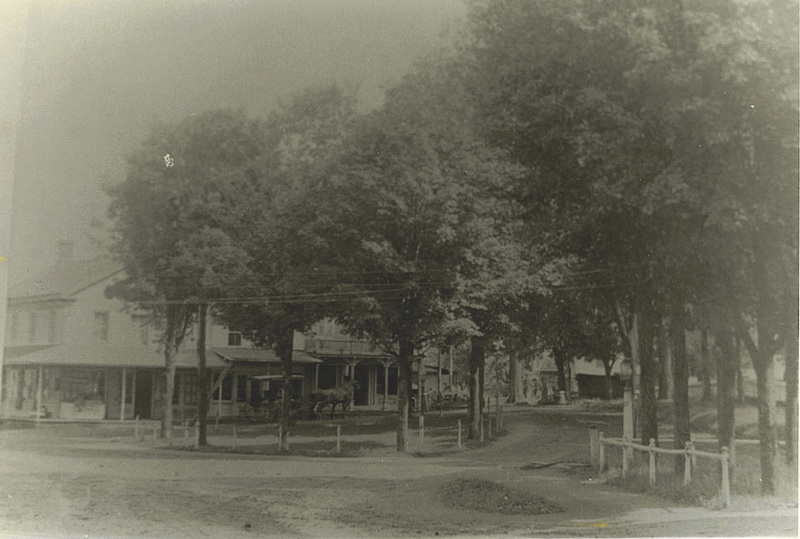 Improvements were made, enclosing it with an iron chain and posts. 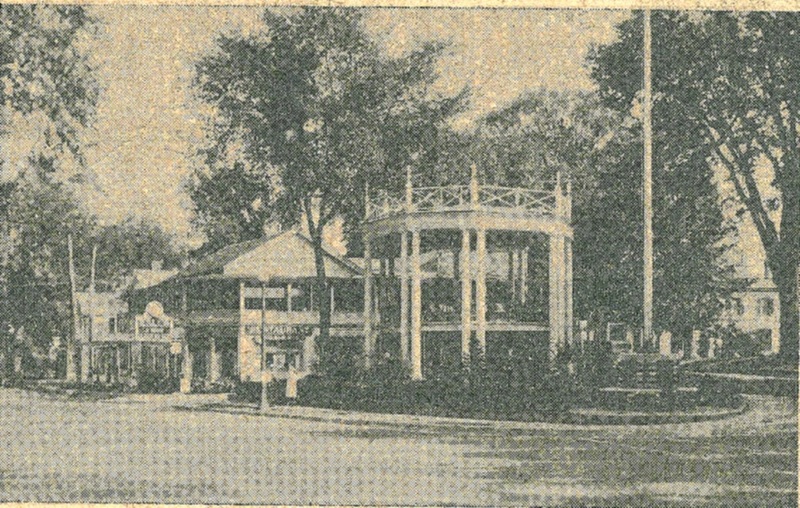 Benches were added by Jack Lynn, owner of an adjacent restaurant. 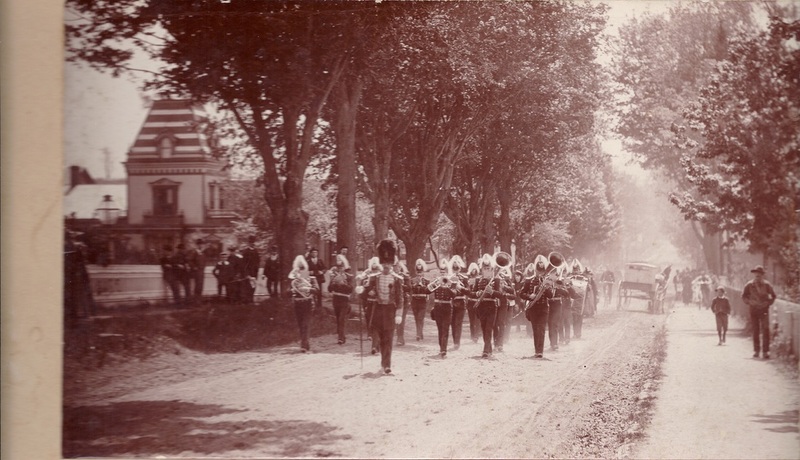 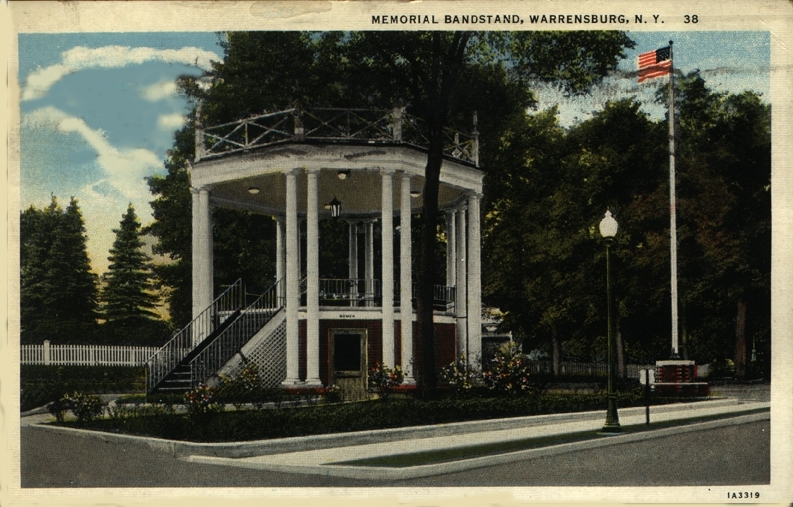 By public subscription, a raised platform was erected for the use of the town band. 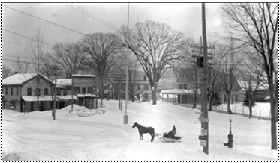 To save it from commercial use, Lewis E. Crandall, Louis E. Reoux, Michael and Thomas O'Connor and Milton N. Eldridge purchased the property, eventually deeding it to the Town with the provision that it should forever be maintained as a public park. 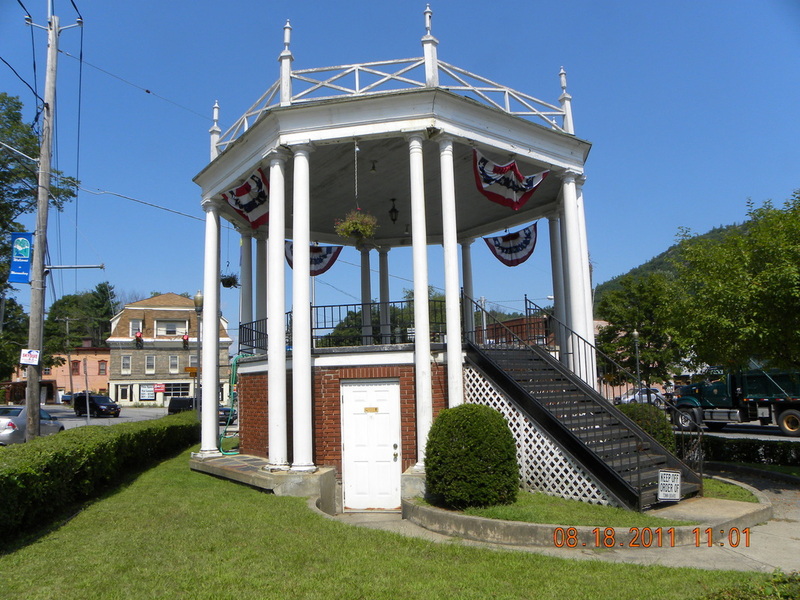 The bandstand at the Elm, Hudson, and Main Street intersection, is dedicated to the memory of the world-renowned aviation hero, Floyd Bennett. 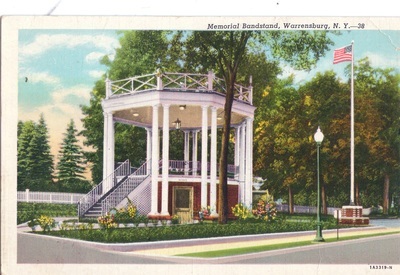 Designer of the bandstand was Paul E. Gurney, architect, and a native of Warrensburgh. 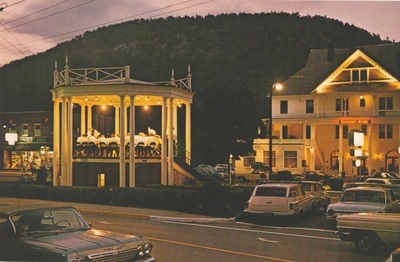 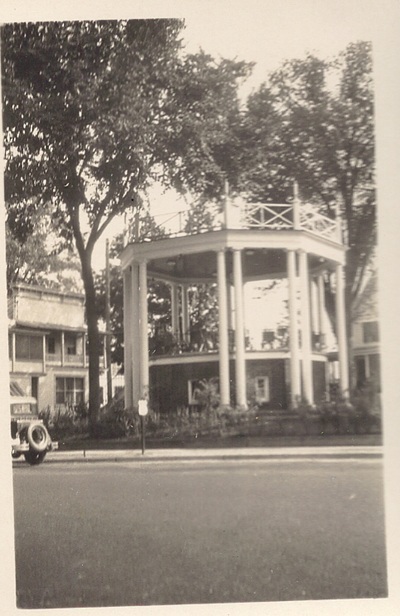 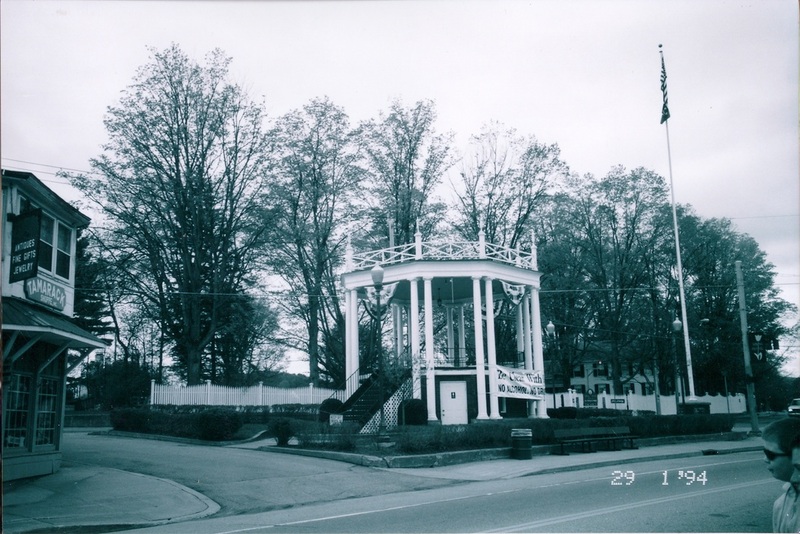 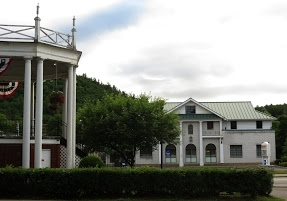 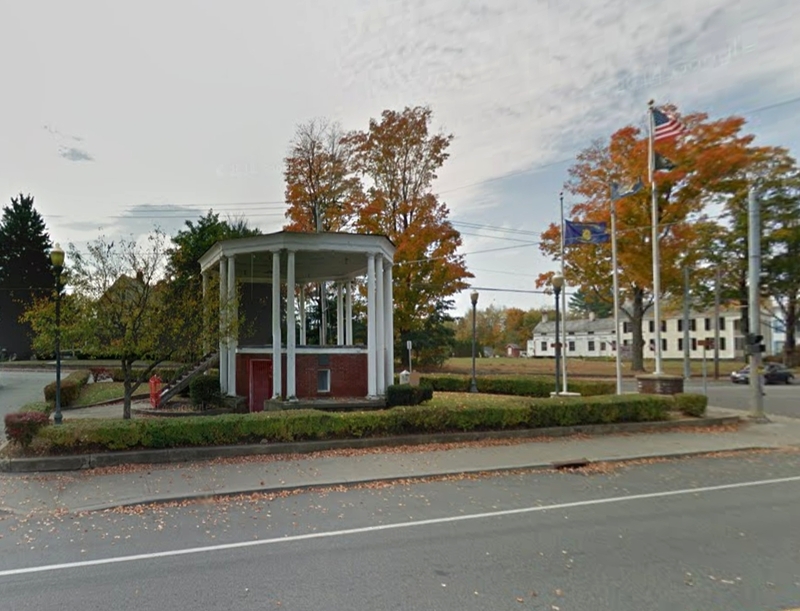 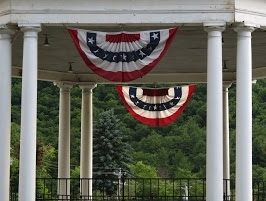 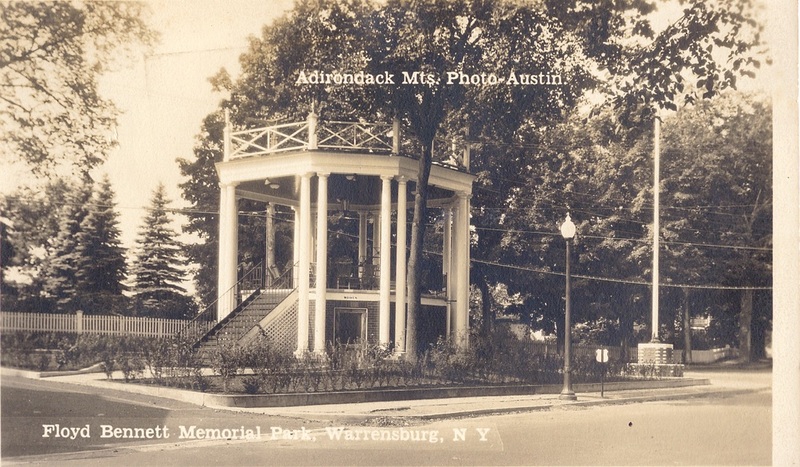 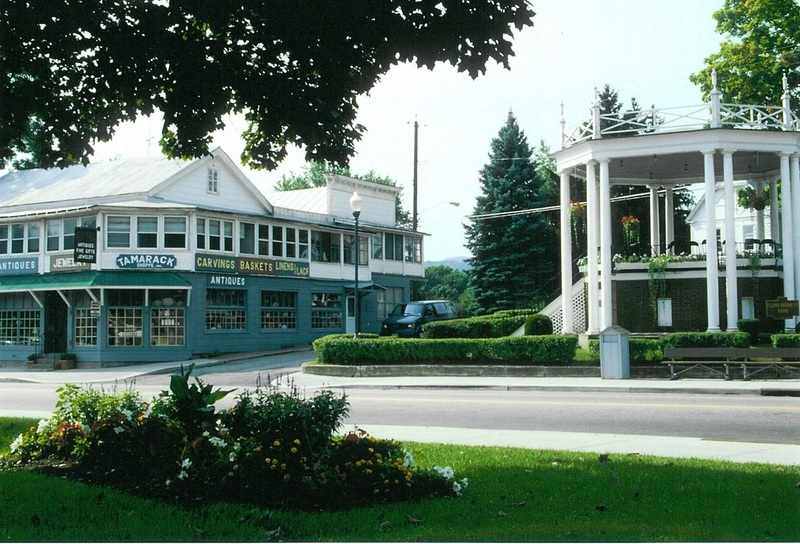 the bandstand, erected in 1929, is Colonial in design to harmonize with the Merrill homestead and the Adirondack Hotel (Colonial Arms), both adjacent to the square. 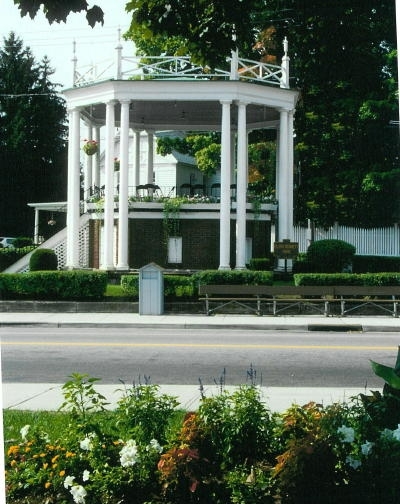 Its octagonal shape provides both beauty and a practical seating arrangement for band members. Through the years, the traditional "concert in the park" has been provided by the Warrensburgh Town Band; a combined school band (Warrensburgh-Lake George-Luzerne) under the direction of Raymond R. Price; the Warrensburg Central School Band; and, for over a decade, the Glens Falls City Band. 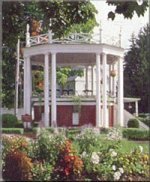 The recent silence from the bandstand is dad...no classical strains of an overture, nor the stirring brass sounds of a Sousa march.